What is a Bid Bond in Maryland? 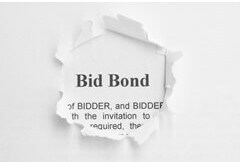 A bid bond is a type of surety bond, that guarantees that the bidder will accept the contract and complete it according to its terms. It provides assurance to the project owner that the bidder has the ability and capability to finish the job once you are selected after winning the bidding process. The simple reason is that you need one so that you get the work. But the larger question is why are more owners/developers requiring a bid bond in the first place? The basic answer is risk. Given the uncertainty of the marketplace, which includes long-time contractors going out of business, to municipalities filing bankruptcy (or just slow paying), has led to owners being afraid that their contractors will be unable complete the work. So, they require a some protection. Most bid bonds contain a bid percentage (usually 5% or 10%, is forfeited if you don’t accept the job). How much does a Bid Bond Cost in Maryland? Swiftbonds does not charge for a bid bond (with two exceptions, see below). The reason that we don't charge for a bid bond is that we will charge for the P&P bond if you win the contract. The cost of a performance bond can vary widely depending on the amount of coverage that is required (see below). 2) We will charge you if there is NOT going to be a performance bond. How much do bonds cost in MD? Bond prices fluctuate based on the job size (that is, it's based on the cost of the underlying contract). The cost of a bond is estimated through a couple of back-of-the-envelope calculations. In general, the cost is approximately three percent (3%) for jobs under $800,000 and then the percentage is lower as the contract amount increases. We work diligently to find the lowest premiums possible in the state of Maryland. Please call us today at (913) 225-8501. We'll find you the very best rate possible for your maintenance bond or completion bond. Things that can affect this pricing are the perceived risk of the job, the financial position of the entity being bonded, plus other factors. How do I get a Bid Bond in Maryland? We make it easy to get a contract bid bond. Just click here to get our Maryland Bid Bond Application. Fill it out and then email it and the Maryland bid specs/contract documents to gary@swiftbonds.com or fax to 855-433-4192. You can also call us at 913-225-8501. We fully review each and every application for bid and performance bonds and then submit it to the surety that we believe will provide the best bid and performance bond for your job. We have a excellent success rate in getting our clients bid and performance bonds at the very best rates possible. What is a Maryland Bid Bond? A bid bond is a bond that assures that you will accept the work if you win the contract. The bid fee (usually 5% or 10%) is a penalty that is paid when you win the bid, but then decide not to take the work. Typically, a bid bond and performance/payment bond are done together in the same contract by the surety. This way, the owner of the project is assured that the project can be completed pursuant to the terms of the contract and that it will not be liened by any contractor. The bond is performance security for the benefit of the owner. The general contractor is the company that obtains the bond. It is for the benefit of the owner (or in the case of government contract work, the governmental entity). However, it's the general contractor that has to apply for the bond and be underwritten before the performance and payment bond is written by the surety. This is also known as bonding a business. See our Massachusetts Bid Bond page here. Surety Bid Bond is very important for anyone, but this is fairly complicated if you do not know anything regarding this. Fundamentally, this is not an insurance claim, but it is a type of guarantee that you, as the principal, will do the work appropriately for the obliged. You must know that most people would require you to get a certain bond before they opt for your services as this will be a form of guarantee to them. Because they need this kind of thing from you, it is important to search for an insurance company that may provide this to you. If you want to get a license bond, permit bond, commercial bond and more, you should understand what Surety Bid Bond means. Here are the things that you must know. Bid Bonds will usually be asked for by the public as it will protect them and it'll guarantee that the principal will fulfill their commitments. You are the principal so you have to get a license Surety Bid Bond to guarantee that your company will usually stick to the laws and you must obtain a contract bond to guarantee that a public construction project will likely be accomplished. These are some examples that will give you an idea about a Surety Bid Bond. This is actually made for the consumers since they are protected by the bond, but it will benefit you as well since they will trust you if you have a Surety Bid Bond. Bid Bonds can already be regarded as a three-party agreement between the principal, the surety company and the obliged. The principal is referred to as the employer or company which will complete the work and the obliged is the project owner. Construction companies are typically necessary to purchase Bid Bonds once they are considering a public project. The government will likely be requiring a construction company to secure a host of bonds if they want to continue with the project. The work of the bonds is aimed at the sub-contractors and workers to guarantee that they will be paid even when the contractor defaults. The contractor will likely be addressing the losses, but once they reached the limit, the duty will surely fall to the surety company. Bid Bonds are typically provided by insurance providers, but you'll find some standalone surety companies that would concentrate on these products. Surety companies are licensed by a state Department of Insurance. It won't be simple to apply for a bond because the applicants will need to go through a procedure that's very comparable to applying for a loan. The bond underwriters will really check the credit profile of the applicant, their financial history and other key factors. It would mean that there is a chance that you will not be approved for a Surety Bid Bond, particularly if the bond underwriters saw something negative. You cannot put an exact price for a Surety Bid Bond since it might be impacted by different factors like the bond type, bond amount, where it will likely be issued, contractual risk, credit score of the applicant and more. There are actually thousands of different bonds available today and the cost will definitely depend on the bond that you are going to get. The amount of bound that you may avail may also be a big factor because you may select a $10,000 bond or a $25,000 bond or higher. If you have a credit rating of 700 and above or very near this number, you could definitely be eligible for the standard bonding market and you only need to pay about 1 to 4 percent of the Surety Bid Bond amount. This means that if you can actually obtain a $10,000 bond, you just need to pay about $100 to $400. Is There A Chance Of Being Denied? There is a chance that the license and permit bond will be denied by the insurance businesses and it will depend upon the background check that they did. If they think that it's going to be a big risk to offer you a Surety Bid Bond, they will surely deny your application. Credit history will probably be a deciding factor as well because if you will have a bad credit rating, it's going to be difficult to get a Surety Bid Bond because organizations will think of you as a risk. If your credit rating is bad, you could still be approved, but you need to pay an interest rate of 10 to 20 percent. If you are going to get your Surety Bid Bond, make sure that you understand the whole process so you won't make a mistake. It will not be simple to apply, but if the requirements are met and you are eligible, you will get a Surety Bid Bond. You can find more on Maryland Performance Bonds here.